Earlier this year I had sent to me 21 shots of Malta buses from Kevin Byrnes with the following comment. "I have just found your site and thought you may appreciate these photos of buses that we took in Valletta in Malta recently. I am not into vehicles but we loved these." Having spent the last four winters in Malta I know them all too well but as from the 3rd of July Arriva have a 10 year contract to run Maltas bus system, when I was there in February they were testing a bendy bus, can't see them working there I'm afraid. Arriva Malta have actually placed an order for 174 buses with Chinese bus manufacturer Xiamen King Long, of which there will be 49 9-metre and 125 12-metre buses. Well at least the locals will be happy, they hated everything about the old ones. Anyway that's enough of that, as Kevin says above he is not into vehicles so his shots are just as he took them and just show Malta buses as they were, which makes them quite different to a lot of the posed shots we are used to on the Old Bus Photos website. Just click anywhere on the shot below to launch the gallery then click the play button, it is a bit slow to start but it will, by the way putting your mouse pointer over the shot will pause the show. It really is sad to see the old buses go. I was over there about eight years ago and the buses were part of the experience, even for non-bus lovers. I mentioned at the time to some locals that, should the buses ever go, many tourists would stay away. I think that may well be the case. What did amuse me was that there was never any certainty about the exact make of chassis. Mainly ASP (all spare parts) as we used to say when young! One of the buses has both Leyland Tiger Cub and Commer on the front grill, but is probably neither of these. Hopefully, many of them will survive in preservation. Couple of points. The bus in the title shot is NOT EBY 537, it is EBY 636 which looks like a Dodge but is actually a Ford V8/Gasan; and the unidentified side view (shot 18) is EBY 540 with Maltese-built chassis and Barbara body. Quite a lot of the old buses survived, some are now in the UK (I have two! ), some in Malta, one in Denmark. Tourism dropped by 5% when the old buses were replaced. More people went to see those buses than the Maltese authorities realised. 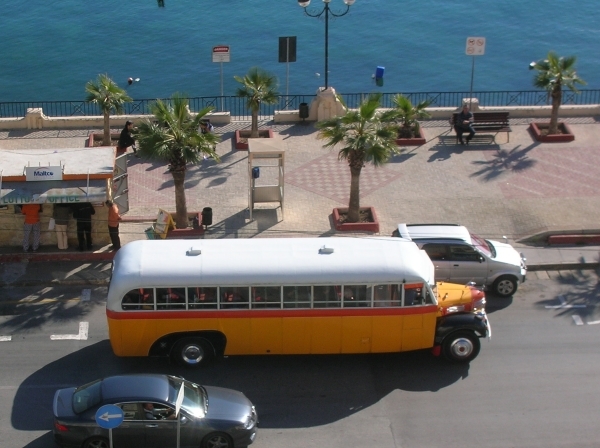 ...as Kevin says above he is not into vehicles so his shots are just as he took them and just show Malta buses as they were, which makes them quite different to a lot of the posed shots we are used to on the Old Bus Photos website. I see what you mean, good shots, makes a very pleasant change. What I find interesting is how many of them have what I think is the Ford Mustang badge on the front and I have heard that some of the drivers drive them like Mustangs. This information has been extracted from "The Malta Buses" Bonnici/Cassar, 1989, and "Malta Bus Album" John Senior, Venture Publications, 2004. Please note that this list definitely needs "E&OE" (errors and omissions excepted) added to it because the Malta bus fleet was notoriously complex and even the following details must be taken with a pinch of salt. I must leave to others more knowledgeable as to what type of "Leyland," "AEC," or "Bedford" etc. they might be. As you will see, there have been two registration renumberings (1980 and 1995). 21. FBY 694 (3225/Y-0694) Bedford SBG (ex-MOD)/Grech? MY QUOTE: "One of the buses has both Leyland Tiger Cub and Commer on the front grill, but is probably neither of these". How right I was - the list show it as an AEC/Barbara - if that can be trusted, of course! Here's another 2 to add to your list DDC104K (EBY 513) and SUP436R (EBY 609) both to Malta, from North East of England. DDC104K new to Begg of Middlesbrough 5/1972 then to Hall's of Sunderland then Carneys of Sunderland then Sowerby of Gilsland Cumbria.then to dealer Morris Evans of Llanfylin Wales to Zarb of Birkirkara. This coach a Bedford YRQ is seen with new front fitted different seating sliding side windows converted to allow further ventilation. Coach was still in service in 2010. SUP436R new to Armstrong of Ebchester, Durham. 8/1976.then to Carneys of Sunderland after Carneys coach is seen in Malta as EBY 609. This Coach was a Bedford YLQ Plaxton Supreme Bodywork. If you input registration to search BLOTW under More - Blue Dot. Is 4 photos of coach in Malta livery. Shows coach as EBY 513. If you input registration to search BLOTW under More is 3 photos of coach 2 in Malta livery and 1 in Armstrong of Ebchester Durham livery. In Malta livery it is seen as EBY 609.